doodling is so fun i am going to try this!!!!!!!!!! Awesome, Max! Let us know how it turns out! Spherikal is amazing!! Working with 3D for a year and a half really pays off. It’s pretty cool how you can do so much with just a sphere. I like the beginning how every time the sphere would rotate round would bea different spiral and how it would twist in the middle of the whole sphere. When the multiple lines were made and it would come out as a sphere and then there was so many lines it was completely black was pretty impressive. Overall I enjoyed watching the video and how fascinating it was that so many things could be created to become a sphere. I really love the Spherikal video!! The 3D animation is incredible and fascinating! I really love the part in the video where it looks like white string is moving to form the sphere, I just wish it would have completed the process instead of it being swallowed by the white. 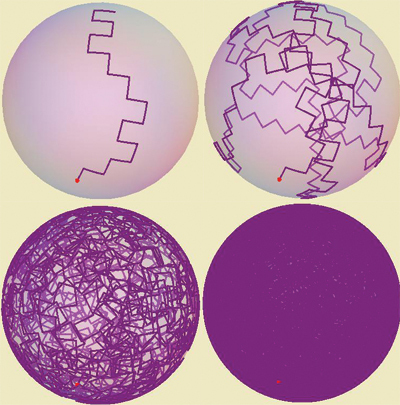 Its really interesting to see the different animations that can be created into a sphere. I loved how the sphere rotated so you can see all around it. The video is amazing and I can watch it all day! I’m glad you enjoyed the Spherikal video so much! I think it’s fascinating how many different takes on a sphere Ion came up with. Mathematical objects–even very simple ones–contain a lot of potential within them. Can you think of a shape that you’d like to explore? I really like 3D art. This video is amazing since it is a spherikal video. I like how the sphere rotates because you can see al around it. I really like this spherikal video. I liked how the sphere rotated in different directions, I liked how it did that. This is one of my favorites so far. I really like this spherikal video. I like how the sphere rotated in different directions, I thought it was cool how it did that. This is one of my favorite videos so far. I like this spherikal video. Its really cool that the sphere goes all around. This video is really cool , and I can probably watch it every day.